Looking to be part of the bigger picture; Join SERVPRO of Lowell Today! Promote and sell franchise services in assigned territory, which results in meeting or exceeding assigned sales goals. Grow and develop commercial customer base by utilizing a systematic business development process to identify new commercial prospects and cultivate relationships using marketing materials like SERVPRO® Key Differentiators, Emergency Ready Plan, National sponsorships, and others to market and sell SERVPRO® Services. Attend, coordinate, and promote marketing, networking, and continuing education events. Monitor loss activity and priority responding to generate work from these opportunities. Monitor and follow up on all assigned jobs, ensuring customer needs are met and all applicable Centers of Influence (COIs) are identified and captured for future reference. This job operates in a professional office environment. This role requires the ability to lift 25lbs, bend, stand, walk, and sit for extended periods of time. This job is 90% OUTSIDE sales job with our territory (Lowell, MA). These positions offer varying hours between 8:00 a.m. and 5:00 p.m., Monday?Friday. These positions may require longer hours and after hours for special events. Occasional weekend events required. Since each smoke and fire damage situation is a little different, each one requires a unique solution tailored for the specific conditions. We have the equipment, expertise, and experience to restore your fire and smoke damage. We will also treat your employees and tenants with empathy and respect and your property with care. This Lowell machine shop suffered from a fire caused by lighting SERVPRO of Lowell] worked around the clock to remediate the property, so that business could be restored as quickly and seamlessly as possible. Many businesses are at risk for a fire, especially when they lease older buildings in need of repairs. 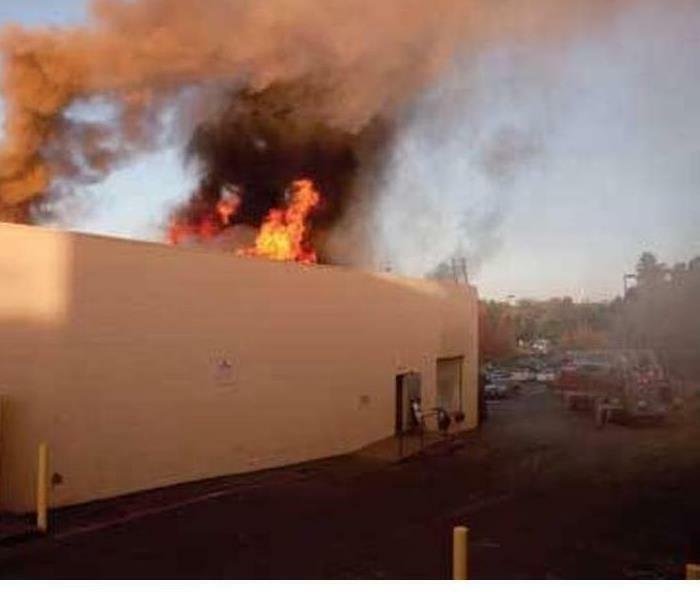 We know how costly and devastating a fire can be to a business, so it is always our goal to get you back up and operating reducing your business interruption. When we visit/inspect your business after a fire loss, we will scope the affected areas to determine the extent of the loss. We will always pretest affected surfaces to determine the type of smoke and which products will help us recover the area most effectively. We have the equipment, expertise, and experience to restore your fire and smoke damage. If a fire has damaged your business, call us right away at 978-454-7577 SERVPRO of Lowell. SERVPRO OF LOWELL is always here to help! Try us today! 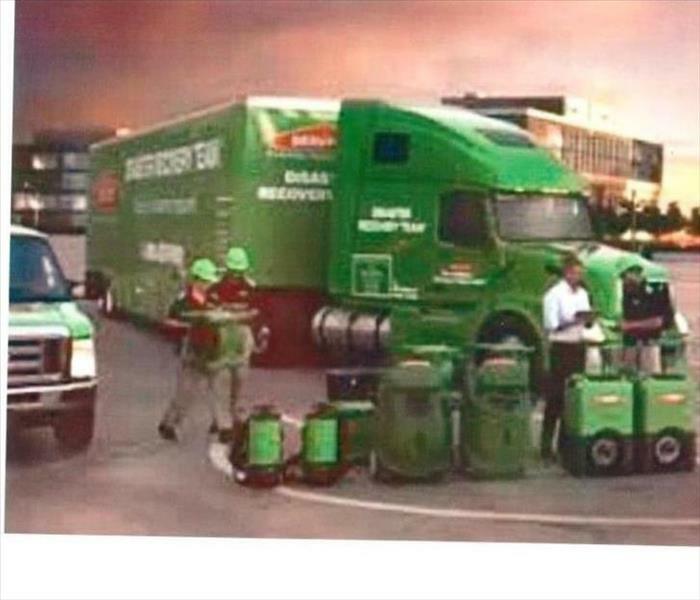 SERVPRO of Lowell provides 24-hour emergency service and is dedicated to being faster to any-sized disaster in Lowell. We can respond immediately to your emergency and have the expertise to handle your restoration or cleaning needs. SERVPRO of Lowell specializes in storm and flood damage restoration. Our highly trained technicians bring the knowledge required to handle your commercial manmade or natural disaster we use specialized equipment to restore your property to its pre-storm condition. We are locally owned and operated able to respond quicker with the right resources, which is extremely important. A fast response lessens the damage, limits secondary damage, reduces business interruption and allows your employees to meet your company’s deadlines. When storms hit Lowell, we are prepared to scale our resources to handle a large storm or flooding disaster. Our access to equipment and personnel from a network Franchises across the country. Elite Disaster Recovery Teams that are strategically located throughout the United States. Have Storm or Flood Damage? Calling (978)454-7577 24/7/365 you will be connected directly no answering service with a team member ready to assist with any size disaster. Our highly trained team members are qualified to assist in all types of devastation. 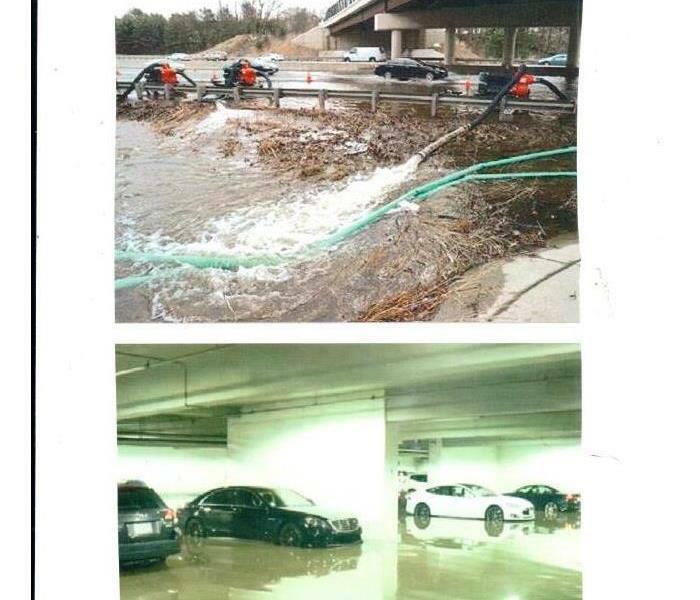 If your commercial property is affected natural or manmade disaster? Call your local restoration company SERVPRO of Lowell 978-454-757. These are some of the services we provide to keep your business operational. SERVPRO Franchise Professionals remove and dispose of bodily fluids, tissue and other potentially pathogenic substances resulting from accident, trauma, crime or death. Our team of Technicians thoroughly clean disinfects and deodorizes the structure. From fingerprint powder and evidence-gathering chemicals to tear gas and pepper spray residues, SERVPRO of Lowell Professionals can clean and restore your property and contents. SERVPRO of Lowell Professionals are recognized as leaders at helping property owners recover quickly from fire and water damage. 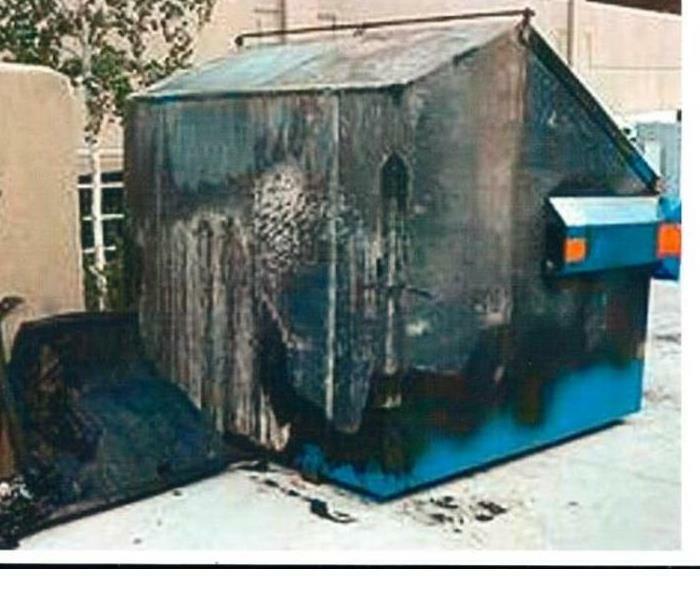 Your local Franchise Professional also provides general cleaning and deodorization services for situations resulting from vandalism including graffiti, egg, spoiled foods and human or animal waste. Sewage backups and black water intrusions are more than nasty, smelly deposits – these damages also introduce harmful microorganisms into a structure. Our Professionals remove the sewage, contaminants and moisture, disinfecting as they clean. SERVPRO of Lowell Professionals helps ensure the structure is properly cleaned, disinfected and deodorized. 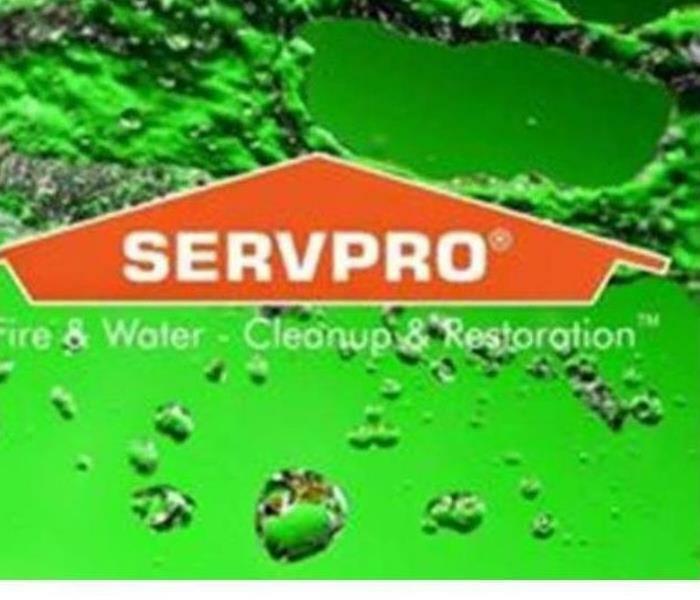 SERVPRO of Lowell 978-454-7577 is ready 24/7/365 to handle all of your restoration requests. Why Clean Duct Work? Not only because they get dirty! renovations or remodeling projectsTop Benefits of HVAC CleaningIndoor Air QualityThrough normal occupation in a home, we generate a great deal of contaminants and air pollutants, such as dander, dust, and chemicals. These contaminants are pulled into the HVAC system and re-circulated 5 to 7 times per day, on average. Over time, this re-circulation causes a build-up of contaminants in the duct work. Contaminants, pollutants, allergens, and mold tend to settle along air vents and ductwork as they are transported through the ventilation system and air ducts. Even though most ductwork systems have air filters as well, not all these contaminants may be contained by the filters. Regular cleaning of air ducts has been seen to improve indoor quality as it improves airflow and reduces the amount of debris within the ductwork that could be transported into indoor environments through the air. Kitchen fumes, tobacco smoke, radon, and mold are some of the most common indoor pollutants, which can intensify the more when combined with higher humidity. Dust particles, mold spores, viruses, and allergens carried through the air from the air ducts can make the matter even worse. By cleaning your home’s air ducts, you actually reduce the chances of indoor pollution by a great degree and promote health, since the duct cleaning process gets rid of most pollutants and contaminants, thus making the air breathed fresher and less contaminated with allergens. Clogged or dirty air ducts can affect your HVAC system’s performance. However, air duct cleaning gets rid of clogged debris and improves air flow, which can actually increase the effectiveness of the system. 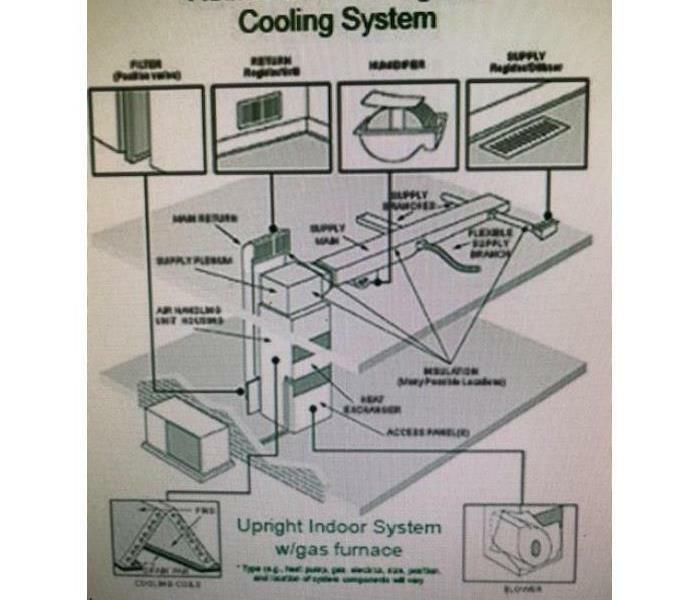 Consequently, this increases indoor comfort as far as heating, cooling, and air conditioning is concerned. As the ducts are cleaned and less clogged, the heating and air conditioning system will struggle less to deliver the desired temperatures inside your home. This could mean less consumption of energy, especially since airflow is improved during the air duct cleaning process. in other words, ductwork cleaning can boost energy efficiency, improve [performance, and reduce conditioning costs since the lesser you HVAC unit struggles, the less likely it is to break down, which also means lower HVAC repair costs during its lifetime. Boosts the Longevity of Your HVAC System:There are various signs that can help determine if it’s time to get air duct cleaning service according to NADCA. which recommends that the process should be more frequent for people with pets at home, smoke indoors, or have a family member with seasonal allergy problems. When a heating and cooling system experiences a problem in terms of air flow, it tends work harder in order to perform as it is required or deliver the preferred temperature conditions. This obviously has an effect on its functionality and durability as the rate of wear and tear is increased. One of the technicians I spoke with at a company that provides air duct cleaning service in Denver confirmed that a thorough duct cleaning can improve an HVAC system’s life expectancy since it helps restore smooth airflow through the HVAC system, and reduces the stress load on the heating and air conditioning equipment. It's time to Turn back time! Check to see if your fire extinguishers need recharging. Check the small gauge at the top of the extinguisher. If the needle in that gauge is in the green, chances are, the extinguisher is okay. If it is in the red, you need to have the extinguisher replaced or recharged. Most common causes of commercial fires and how to safeguard against them: 1. Cooking Cooking is the most common cause of both residential and commercial fires. In the commercial arena, we tend to associate cooking fires with restaurants, but the problem extends to office kitchens as well. Treat all kitchens the same, wherever they are. All kitchen should have a smoke detector, a well-conditioned fire extinguisher and strict safety protocols, including no unmanned appliances. 2. Electrical When it comes to electrical fires, the problem is twofold: user error and electrical system malfunctions. In the realm of user error, the big issues are frayed power cords, misused extension cords and overloaded and daisy-chained surge protectors. When it comes to a system malfunction, the biggest problem is faulty wiring, which is why it’s essential that all commercial buildings have their electrical systems regularly serviced by a professional. 3. Heating Fires caused by heating are similar to those caused by electrical factors in that they’re caused by both user error and system malfunction. The most common form of user error is misuse of space heaters. Commercial spaces often have cold spots, and space heaters are a great way to alleviate that. Space heaters are also quite dangerous if users don’t respect a three-foot or greater safety zone around the unit. As for system malfunctions, fires often occur due to dust buildup and ventilation blockage, so be sure to have your heating system checked regularly. 4. Arson Arson is much more common than you might realize. Although it often occurs at abandoned commercial structures, arson fires that occur at occupied buildings can be devastating. In addition to monitored fire detection and fire suppression measures, security cameras are an essential defense. 5. Smoking Smoking was once a leading cause of commercial fires. Even in smoke-free buildings however, cigarettes can and do lead to fire. Prevention starts with commercial alarm monitoring, but it also requires proper receptacles and fire-retardant furniture. 6. Combustibles Most commercial buildings, including basic offices, must have combustible materials on hand. The real danger with such materials comes when they’re stored improperly, and this is a common occurrence because the materials are often being managed by people who aren’t trained in proper use. Therefore, it’s crucial to have safe storage space available, but it’s also essential that the business trains employees in the use of such materials and continues to refresh that education. Commercial Safety When it comes to fire and other risks to a commercial enterprise, it’s best to be proactive. Contact a security company that specializes in commercial security systems. They can help you identify risk factors in your place of business and make recommendations to help protect your enterprise against fire-related catastrophes. 24/7/365 You’ll be connected immediately a team members ready to assist you. Flooding and water damage events at Lowell commercial properties are often complex with numerous issues that require a knowledgeable and flexible response. Whether we’re dealing with a relatively small water cleanup scenario or a large scale event, we work quickly to assess each unique situation and isolate the damaged area. In many instances, normal operations can continue in a temporary space while we restore your facility. Our professionals are trained to be mindful of legal and environmental concerns and strive to fully restore the damaged area while working within your budgetary constraints. We understand that every hour spent cleaning up is an hour of lost revenue and productivity. So when an emergency situation arises in your business, give us a call and we’ll be there fast with the help you need. When you need your business restored rapidly SERVPRO of Lowell is ready to make that happen. We’re faster to any size disaster. 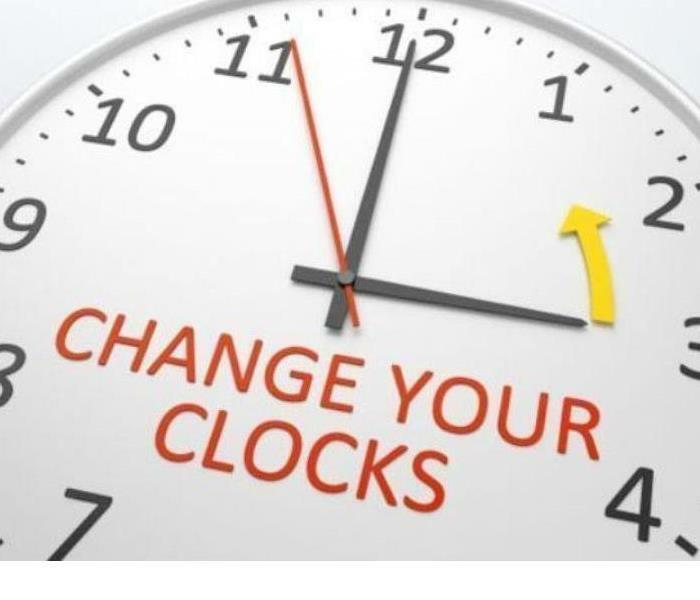 11/5/2018 - When Time counts! 10/29/2018 - Why Clean Duct Work? Not only because they get dirty!